I just got my ocarina from Charlie in the mail today and I must say I'm amazed by it. The instrument's woodgrain looks impeccable and its joinery is almost invisible. At first glance, it definitely looks like a professional instrument and a great piece of woodwork. Playing it only confirms that, as its tone is remarkably soft and sweet. It's not as loud as many ceramic ocarinas, which makes it ideal for playing indoors or around anyone with sensitive hearing. This can also make it useful in sessions in which a louder ocarina might overpower other instruments. If it's too quiet for a particular setting, you can always amplify it. It takes a gentle and even breath across most of its scale. From B to high C, all one needs is a whisper of air to keep it in tune. Having last played a Pure Soprano G, I actually had difficulties staying in pitch with this ocarina since the Pure requires a much stronger breath and has a slight breath curve throughout its playing range. The high D and high E take slightly more air, but they're easy to adjust for and thus not difficult to hit even at session tempo. 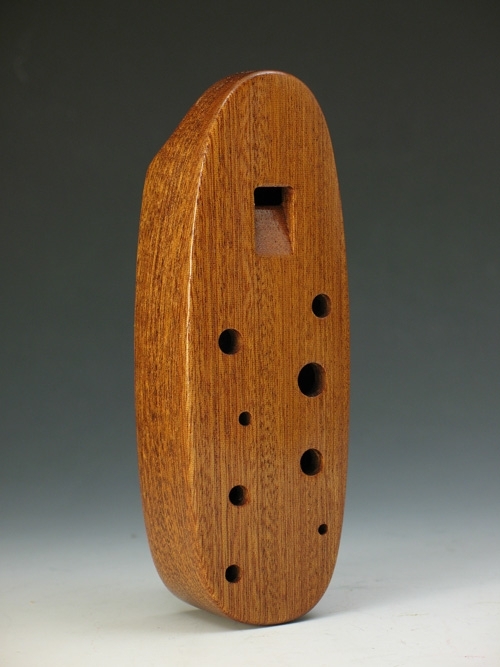 All in all, this ocarina is a compact and beautifully crafted instrument that beginning and avid players alike can enjoy. While I'd be wary about ordering it in the winter in a cold climate because of a rather unfortunate experience with another wooden instrument I ordered in the past, I'd have no reservations suggesting this lovely piece to anyone on a budget looking for an alto C and a new lifelong friend. Thanks, Charlie!